A preservation easement, called a preservation restriction in Massachusetts, is a legal agreement made between an owner of a historic property and a qualified easement holding organization. The easement protects the architectural integrity of the property by restricting future alterations and uses. Preservation easements can protect both the exterior and interior of a qualifying property. Why is it important to create preservation easements? As an owner of one of Nantucket’s historic buildings, you are a steward of one of the Island’s greatest resources, its architectural heritage. 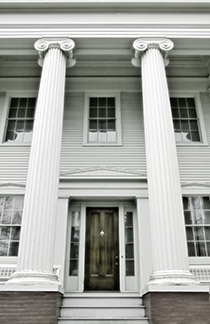 By creating a preservation easement, you can protect your property’s historic features for future generations. Today a preservation easement is the best tool available to ensure the long-term integrity of a building as well as its place in the community. In addition, an easement donation may be considered a tax-deductible charitable contribution for federal income tax purposes. What properties are eligible for preservation easements? Preservation easements are limited to historic structures or sites significant for their architecture, archaeology or associations in history. In Massachusetts, these include historically significant buildings, structures, landscape features, and archaeological sites and their settings listed or eligible for listing on the National Register of Historic Places. On Nantucket, over 2,400 structures are certified as contributing to the Island’s designation as a National Historic Landmark. These structures can qualify for preservation easements. What elements are included in a preservation easement? Each preservation easement is unique and tailored to the building and the needs of the property owner. It is a flexible tool that leaves the owner with full use of the property, but protects specific historic features forever. Future owners are legally required to obey the restriction. The easement document includes enforcement provisions. Protected features include the building‘s exterior (already regulated by the Historic District Commission) and historic interior features such as structural members, space configurations, chimneys, plaster walls, floors, woodwork, and stairways. Where appropriate the easement can protect original and historic hardware, decorative finishes, and fixtures. The document is usually prepared to exclude modern additions, bathrooms, and kitchens. The first step is to contact us. NPT can provide general information and will arrange for a site visit to answer specific questions and to discuss the process in detail. We also can begin to identify historic features worthy of protection and start to prepare a document of recommended areas and elements. We highly suggest you meet with your attorney and/or tax advisor to share our recommendations and to get specific on how this process can work for you. This is especially important if you are interested in learning more about the federal tax benefits associated with donating an easement. Once you decide to proceed, we will work with you to finalize the list of elements and develop a baseline of protected features. The NPT will then prepare draft legal documents and agreements for your review. The process takes six to nine months on average to complete due largely to required governmental reviews. Under Massachusetts law, the Massachusetts Historical Commission (“MHC”) must certify that the structure is eligible and must approve the preservation easement document once signed by the property owner and the NPT. MHC will then review the document and suggest changes. Standard requirements that meet MHC regulations must be incorporated into the easement agreement. MHC will sign the final document once approved by all other parties, including the Town of Nantucket. State law requires the approval of the local municipality. This step includes review by Town Counsel to ensure all required documentation is in order. The easement is first presented before the Board of Selectmen for discussion and a second time once Town Counsel review and MHC review is completed. Upon execution of the agreement the preservation easement, state law requires the document to be recorded. If the property is subject to a lien such as a mortgage, the lien(s) must be subordinated to the preservation easement. A fully executed subordination form will be required prior to Town review. Most lending institutions are familiar with this process and can provide you with the required information and forms. If you have a mortgage on the property, we recommend that you work with your attorney to secure subordination early in the process. If you plan to take advantage of possible tax benefits, you should ask your attorney and/or tax advisor about reporting requirements. We also will need to enter into an agreement with you regarding enforcement of the easement. In addition, you will need to obtain a certified appraisal that meets IRS standards. What happens after the easement is recorded? Once the easement is recorded, we will meet with you at least once a year to monitor the easement and to answer questions and provide preservation assistance. If you sell the property, monitoring and enforcement of the preservation easement will continue. This process, like the easement will continue in perpetuity. At times, repair of elements is necessary. Routine changes such as replacing shingles in kind can occur without notification. Other changes to the easement elements must be approved by NPT. The easement agreement addresses these issues.